Heraldry probably began with the knights in armour. When wearing a helmet in battle or in tournaments a knight could not be recognised; so he used symbols to decorate his shield and surcoat. The surcoat was the loose garment worn over the armour to protect it from rain or hot sun and actually was the "coat-of-arms"; it was decorated on the front and back with the same device as on the shield. The correct expression for entire design is an achievement. An achievement consists of the shield, helmet, rest, wreath, mantling and motto. These are the main parts. To them can be added supporters and a compartment. In the centre is the most important part, the shield. The surface of the shield is called the field and on it the colourful charges are placed. 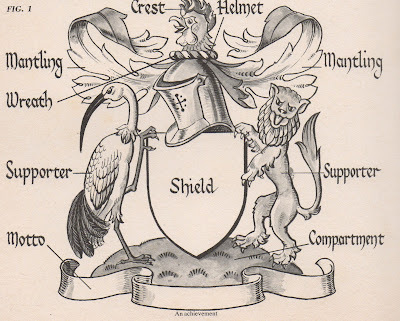 The shield is called the arms or coat-of-arms and can be drawn in any shape - in an upright position or slanting, which is the position it would fall into if hung on a peg. In Heraldry it slants to dexter. They can be of any design, but should keep to the positions and metals stated. When drawn in profile they should always face "dexter" A common fault is often made in drawing the helmet too small. It should be drawn almost as large as the shield. The mantling (or lambrequin) represents the cloth cape which hung down the back of the helmet to keep the hot rays of the sun off the metal. I battle this became torn and hung in rags, and artists when drawing the cape turned these rags into simple, slashed design. The mantling is coloured in the principal metal and and colour of the shield, the underside of the mantle being the metal. The wreath (or torse) was silk, a skein of cloth formed into a circle with a gold or silver cord twisted round it. This was worn on the helmet to cover the joint between crest and mantling. It is always drawn with six twists and coloured alternately, metal first, then colour. The crest was warn on top of the helmet and was originally designed to ward off a blow aimed at the head. It was made in wood or leather. A crest can be used on its own, and many people who have a coat -of-arms with a crest use it on their personal belongings, such as silver, cutlery, notepaper, etc. No one should use a crest unless entitled to one. The motto can be anything, and often has a personal meaning, usually written on a scroll; it can be in any language or colour. In Scotland the scroll is often over the crest; otherwise it is under the shield. The supporters fill up the spaces either side of the shield. Not every "achievement" has them. they are a great honour, being granted only in special cases, Supporters can be human beings, animals, birds or imaginary creatures, painted in heraldic or "proper" colours. The Compartment. In Scotland "supporters"stand on a mound, rocks or seashore, with some special feature mentioned, such as plants of their clan-badge. On the scroll at the foot of the mound was the cry of the clan. Many other older "achievements" show the supporters standing on the edge of the scroll or some other ornamentation, but now most are drawn with a mound for the supporters to stand on. All these things made up and achievement, and the heraldic description describing them is called the matriculation of arms.